Whether it’s only been a few months, or it has been a couple of years, going back to work after being at home with your little one is never easy. This is a reality that almost all families deal with at some point, unless one of the parents is able to be the daytime caregiver until the child is school-aged. One of the most challenging things for parents returning to work, can often be the decision about what type of care suits their child and family’s needs best. Options can include family members, or friends who also have young children at home, nannies, daycares, dayhomes, and others. Aside from hours, availability and schedule there are many other things to look for in quality childcare. 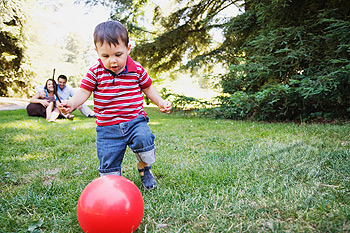 Stimulating and involved, in an age appropriate manner: For example, when playing outside do they communicate with the children, or simply supervise? Do they plan fun outdoor activities, or simply let the children play all the time? When changing diapers or feeding/eating with the children, do they engage? Conscious about the environment the child spends time in: Is the setting arranged in such a way that it is safe, sanitary, and inviting? Are toys and activities set up so that they are appealing and inviting, with easy access? Do they rotate toys occasionally to spark interest and new learning experiences? Knowledgeable and understanding of child development: Knowing the ages and stages of development, as well as understanding that young children are at an age where quality caregiving is crucial to their development, is a must. Patient and responsive: In other words, do they genuinely respond to inquisitive children and promote learning? Providing learning experiences that enhance all areas of infant and toddler development: While having a l oving and attentive caregiver is usually the most important thing for parents, it’s also imperative that young children be exposed to age appropriate activities to stimulate physical development, intellectual and language development, social development, and that foster creative learning as well. Will your child get ample fresh air and opportunities for gross and fine motor growth? Will they have open-ended art experiences? Are they being read and sung to? Do they spend time with other children? Prepared to work with parents through developmental milestones: such as changes to nap routines, nutritional issues, toilet training, bottles/weaning, etc. What are their philosophies in these areas? Familiar with appropriate guidance and discipline techniques: it’s important to make sure that their beliefs about discipline and conflict resolution do not differ greatly from the parents’, and that parents are aware of what the guidance and discipline techniques are, and are comfortable with them. These are just a few of the considerations I recommend parents make, and of course not all child care situations are alike. Therefore, parents should make a list of what is important to their own family and belief systems and consider whether those things will be met. For a child who is being looked after by a grandparent, for example, not all of these questions will apply. However, it is no less important that the grandparent not simply put the baby in a swing all day, or the toddler in front of the TV for hours at a time. In the end, it all comes down to what is of importance to each individual family, but I do find this to be a good starting point.